HOUSTON–The concept of restimulating producing wells is highly compelling, particularly in onshore horizontal resource plays where production is characterized by initial high rates early in a well’s life followed by steep declines. Restimulating an existing asset gives the operator the ability to increase production and generate economic benefits without the cost of drilling a new well or installing new production infrastructure. The success of any restimulation treatment hinges on a variety of factors, including selecting the right candidate well with sufficient remaining reserves, selecting the right treatment to economically recover those reserves, and implementing production practices to maximize the return on investment. However, another critically important factor is selecting the correct treatment deployment technique. 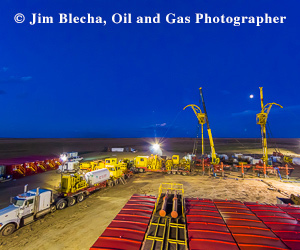 On the Northwest Shelf of the Delaware Basin in Southeast New Mexico, Occidental Petroleum used a novel straddle packer system to recomplete 26 zones in a horizontal well in the Yeso formation in a timely and cost-effective manner. The system enabled Occidental to realize a 50 percent increase in well production by restimulating the zones with a hydrochloric acid-based fluid while saving at least 10 days of rig time by recompleting the entire lateral in a single trip. The well was one of six, one-mile-long horizontal wells Occidental drilled in the area targeting the Yeso formation. All six wells were drilled back-to-back and completed with 10 hydraulic fracturing stages using the plug-and-perf method. Figure 1 shows the configuration of the wells in the sections, as well as their locations in a structure and net thickness map. Note that within the area, the gross reservoir thickness increases to the east. The straddle packer technology provides discrete stage isolation using two mechanically-activated sealing elements rather than conventional sealing cups to overcome the wear issues and bottom-hole pressure limitations found in traditional straddle systems. It enables higher flow rates and pressure differentials as well as a larger number of stages, thereby reducing the amount of trips required to complete a restimulation operation in either vertical or horizontal wells. The Yeso well results demonstrate how this new technology makes it possible to pump multiple treatments in a single trip to reduce the operational time, resources and cost associated with well restimulation. In this well, the straddle packer system reduced operational time by 30 percent compared with other methods, and allowed the well to be treated with full mechanical isolation in a manner that had not been previously possible. Moreover, pressure data gathered during treatment suggested limited cluster efficiency on the well’s primary fracturing operation. After investing time and resources to select the right candidate well and determine the most effective treatment (acid, acid fracture, propped fracture, etc. ), it is fundamental to ensure that the selected treatment will go where it needs to go. Proper coverage of the treatment over all target intervals is crucial to achieving the desired results. Treatments can be placed using either chemical or mechanical means. Chemical approaches include solid or gaseous diverters that temporarily plug porous channels and change the path of least resistance for the treatment to follow, inducing increased coverage. Many diverters are flowed back or dissolve over time. While chemical placement can be cost-effective and simple because they require almost no intervention work, effectiveness can be limited by friction pressures, treatment rates and operating temperature ranges. Mechanical placement techniques are more operationally complicated and sometimes more expensive, but mechanical systems are much more effective at targeted treatment placement. More permanent options include cement plugs, gel plugs, casing patches, liners and expandable liners. Temporary well intervention options include repeatedly isolating the target interval using plugs and a retrievable packer or using resettable straddle packers for zonal isolation. Straddle packers consist of at least two isolation elements separated by a treating port that communicates the work string to the treatment area. Typically, spacers can be added between the packers to modify the length of the section to be straddled, depending on the necessary zonal isolation. Different types of straddle packers are available, but most straddle packer systems focus on performing a limited number of tasks well (i.e., going through tubing restrictions and expanding to larger casing sizes, achieving a maximum pressure differential or flow rate, conveying proppant, coiled tubing-conveyance, etc.). Each design generally has performance constraints. For example, a highly expandable inflatable straddle may be limited on maximum flow rate, while a system designed for maximum pressure differential may have a confined ability to pump proppant. To overcome these limitations, the new straddle assembly is comprised of two fully mechanical packers and a treating port that can be closed to enable debris circulation to minimize stuck-in-hole risk (Figure 2). The design eliminates the use of sealing cups, which wear as they are run down hole, and can result in more zones per trip, less nonproductive time spent tripping tools and reduced HS&E risk. The straddle system also is fitted with three memory gauge subs that record five streams of pressure and temperature data at different parts of the tool during treatment, providing valuable insights for post-job analysis. The packers are activated using J-slot mechanisms, which make them coiled tubing-friendly because no rotation is required. This feature also makes the straddle tool applicable to any bottom-hole pressure conditions because its actuation does not depend on formation pressure or hold-down buttons. A large bore permits propped frac rates up to 20 barrels/minute and a moderate expansion element enables pressure differentials up to 10,000 psi with multiple cycles. No mechanical or operational issues were observed while fracturing and producing any of the six Yeso wells. Scale problems, specifically calcium and iron sulfates, are common in the formation in this area. Consequently, all wells were chemically treated frequently. Moreover, none of the wells could flow naturally because of lower reservoir pressures, so artificial lift had been installed in all six since day one. There were no downhole pressure gauges installed, but wellhead pressures were recorded periodically. All six wells were landed in the same zone of the Yeso formation and completed with the same design using similar amounts of proppant. From the production data analysis, there appears to be a correlation between reservoir thickness and first-year cumulative oil production. However, Well 4 had the lowest cumulative first-year production (67 percent lower on average than its five neighboring wells), even though it is located in the middle of the development where the reservoir is thicker than at Wells 1, 2 and 3. As shown in Figure 3, not only did Well 4’s production profile not match those of Wells 3 and 5 (with similar reservoir quality), but it exhibited a level production profile rather than reaching a normal peak production, as was clearly observed in the adjacent wells’ production histories. There was no “tested-and-true” recipe to treat these wells. Conventional deployment techniques such as plug-and-packer were considered, but based on cost and risk factors, an HCl-based fluid that had previously been used on similar vertical wells in the area was chosen to restimulate Well 4. The strategy was to optimize treatment volumes to keep costs down by taking advantage of the straddle system’s ability to precisely place treatment volumes in individual sets of perforations or clusters. A workover rig with 2-inch tubing was used to deploy the straddle and acidize the 30 perforation clusters individually by pumping 1,500 gallons of 15-percent HCl fluid on each. The operation was performed in a single trip from beginning to completion, and it lasted approximately 30 hours spread over three days of daylight hours. Figure 4 shows an overall pressure versus time plot of the operation recorded with the onboard pressure (red) and temperature (blue) gauges. The flat curves correspond to overnight shutdowns. Sensors 518 and 519 were located above the packer internally and externally, respectively. Sensors 41458 and 41373 were in the straddle section, and sensor 41457 was below the packer. On the first day, after running the straddle assembly in the hole and testing it, the three deepest clusters were isolated and treated individually before shutting down operations for the night. On the second day, the next 12 clusters were isolated and treated individually. On the third day, 11 more clusters were isolated and treated individually. Because of time limitations, the decision was made to treat the last four stages at once. Pump rates ranged from 3.5 to 10 barrels/minute with treating pressures ranging from 1,500 to 4,800 psi. After all stages were completed, the straddle packer was pulled out of the hole, set in the vertical section, and successfully pressure tested to 1,600 psi to ensure proper operation and isolation. Figure 5 shows stage 17’s individual pressure versus time plot. The solid lines represent pressures, while the dashed lines represent temperatures. The solid blue line plots pressure in the straddle section (between the mechanical packers) during treatment. It shows a steady increase at the start of treatment, a steady curve at approximately 3,300 psi while injecting into formation, a decrease toward the end, and then pressure equalization when the packer was unset. The solid red and green lines that hold steady at ±500 psi during treatment represent the pressure above and below the packer, respectively, and denote full isolation of the perforation cluster. On average, it took 15 minutes to move and set the straddle packer for the next stage using the workover pipe. A total of 1,109 barrels of treatment fluid were pumped, and 952 barrels of freshwater were used to flush the treatments. No downtime was recorded during the operation. When the well was put on production and load fluid was recovered, the operator recorded a 50 percent increase in the pre-treatment daily production rate. By comparison, a similar intervention targeting individual perforations using plugs and packers would have taken an estimated 15 days to treat two zones a day. Similarly, it would have involved at least 30 trips in the hole with additional trips to either recover or mill the plugs, which would have involved additional operational days, likely making restimulation uneconomic. It is believed that the ability to isolate and treat individual clusters was the key to successfully achieving increased production. When plotting average surface treating pressure recorded during the operation by stage, it was observed that pressure was lower at every third cluster compared with the previous two at the same or higher pump rate. In other words, zone three had the lowest average pressure when compared with zones one and two, zone six had the lowest average pressure when compared to zones four and five, and so on. By itself, this was a curious result. However, in light of the well’s original completion–a 10-stage plug and perf multistage fracturing job with three clusters per stage–this field observation may take on new meaning. The original completion perforated three clusters in the same wireline run, and then hydraulically fractured all three clusters at once. In each set of three clusters, the third zone was always closest to surface (the first cluster to be reached by fracturing fluid and proppant during the primary completion). Considering frictional effects in the lateral, it is possible that each zone three had better stimulation during the initial fracturing job, resulting in better conductivity, which would explain why every third zone had lower average injection pressures during restimulation. In this rationale, the straddle packer system was crucial to uniformly delivering treatment fluid to each perforation and removing the natural tendency of some clusters to take fluid before others. The straddle packer system enabled the cost-effective recompletion of 26 zones in a single trip, and resulted in increased production for the Yeso horizontal well. However, using a coiled tubing unit instead of a workover rig could have reduced operational time on location even further. If restimulation rates and economics allow it, using a CT unit would be the preferred method on future projects. Tasos Boulis is a senior reservoir engineer for Occidental Petroleum’s Permian Resources North New Mexico business unit. His experience prior to Occidental included reservoir and completion engineering roles with a major service company related to reservoir characterization, completion and production optimization for several unconventional fields worldwide. Boulis holds a B.S. in drilling and mining engineering from the National Technical University of Athens and an M.S. in petroleum engineering from Texas A&M University. Travis Vulgamore is an engineering adviser for stimulation with Occidental’s worldwide drilling and completions team. His experience prior to Occidental included gas plant design, hydraulic fracturing, acidizing, cementing and fracture diagnostics. Vulgamore has consulted on various conventional and unconventional projects in most North American formations as well as various formations worldwide. He holds a B.S. in natural gas engineering from Texas A&M University at Kingsville. Luis Castro is global solutions manager for integrated well intervention at Baker Hughes, a GE company. With 19 years of industry experience, he began his career as a well intervention field engineer, and subsequently has served BHGE in a variety of operational, technical, managerial and technology roles in coiled tubing, intervention, stimulation and multistage fracturing. Castro holds a B.S. in chemical engineering from Universidad Simón Bolívar and an M.S. in international management from Hamline University.